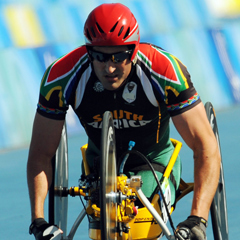 London - South Africa wheelchair racer Ernst van Dyk has finished outside of medal contention in the men's individual H4 time trial finals at the Paralympic Games on Tuesday. Van Dyk finished fith in a time of 26:35.95. Italy's Alessandro Zanardi won gold in 24:50.22, Germany's Norbert Mosandl silver in 25:17.40, while America's Oscar Sanchez took bronze in 25:35.26. In other road cycling events, South Africa's Stuart Mc Creadie finished seventh in the men's individual H2 time trial finals. His time of 29:03.51 was more than two minutes behind gold medal winner Heinz Frei of Switzerland who finished in 26:52.39. Gerhard Viljoen (15:26.41) finished seventh in the mixed T1-2 time trial finals, while Madre Carinus (16:54.16) finished 12th.